the Kingfisherteam in co-operation with some other Italian Geocacher (cmauri, kazuma, i5fzi, GENicogiorgi, kdv, leo99, ilBoss, Itamagellano01, Vericol, bluemarlin, barafondateam, LadiniaGeocachingTeam and kirkadore) has sketched the first off. ital. Geocoin . Before we work on the last refinement, we would like to know, how many persons would be interested in this country-coin at all, thus we have to order the edition (approx. 500-1000 Coins). The Coin becomes 38mm/3mm , front 3D, back 5-colour and 4 metal refinements(with 500pc. : 75 gold antique, 125 nickel antique, 50 twotone, 250 nickel). 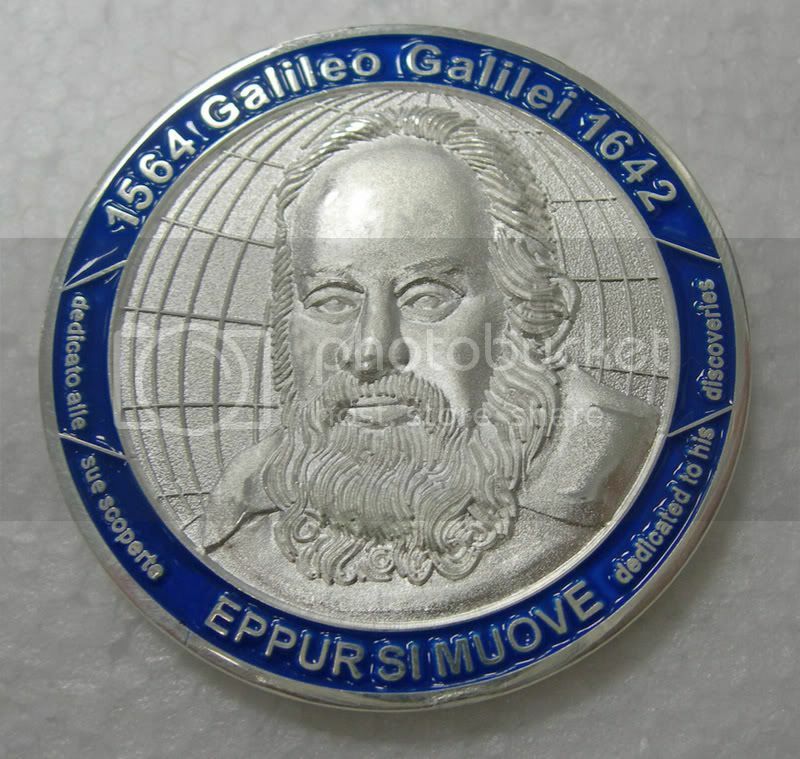 On the back you can see Italy in the national colors, on the front Galileo Galilei is represented in the globe (3D). There are also own symbol and Prefix. These are good, but I'd like to see the final version and few more details like price and shipping. I am in for one or two. I´m in for one of each metal. I'd like one of each metal. Thanks! ICE is in, roughly 10-12. I can get you a better number when you are ready. Being a very proud Italian! I'd love a couple! Nice. I like the simplicity of the first (top) design posted here. I'd be interested in one of each metal. I would like one of the two tone ones. Depending on the price, but interested. Would like 1 two tone 1 antique nickel, Please! Do you know the price with shipping, yet? Depending on price and shipping, I would like one of each metal. 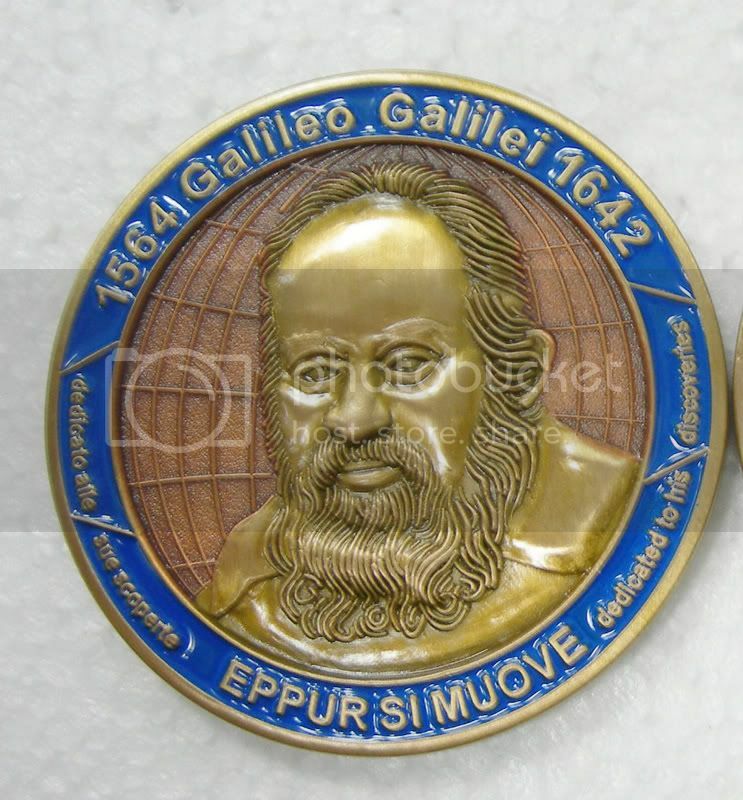 May we respectfully suggest, for deep 3D relief of Galileo you may want to consider 3.5mm thickness (or even 4.0mm). I'd be interested in 2 nickel depending on pricing. I would be interested in 1 or 2 depending on price. If it has an icon, I'd be in for 2. I like the top design, and I'd buy one depending on price. Please keep it under $10 US ($8 US would be great). We received the photos of the coins now. by us before beginning of the preorder. I'd be interested in a few of these, really like the first photo of the sample coin. ICE will be interested in some. 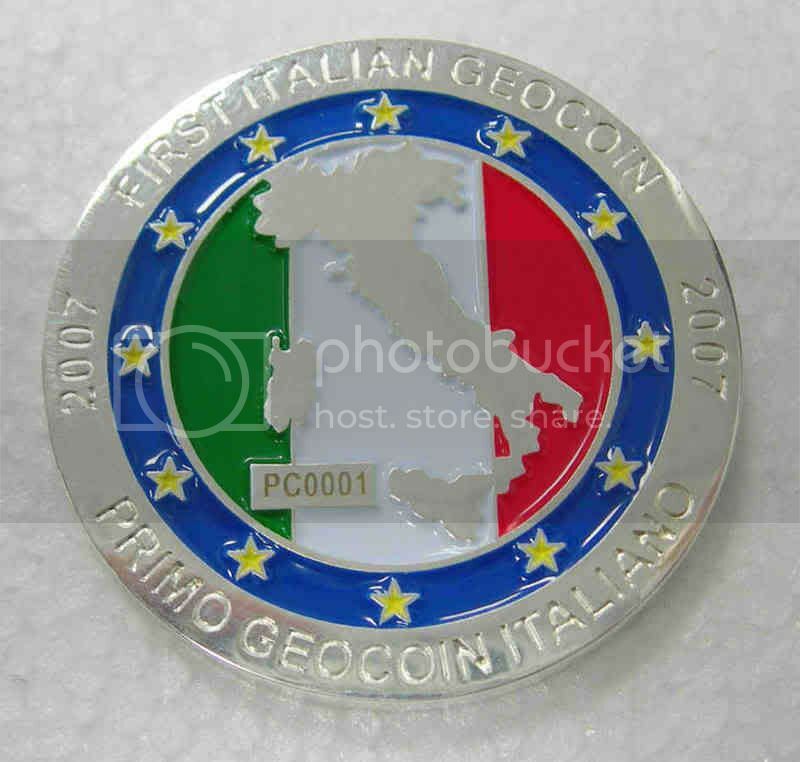 I would definatly love to have two of these coins as I am Italian and could not be with out this geocoin!! Interested in one of each metal, depending on the price. Put me down for a complete set ! Love them ! I'd be interested, yes, indeed. Please put me down for two of these please. Thanks. Would like 1 two tone, 1 antique nickel and 1 Antique Bronze/Gold, Please! Will the final have " Trackable at Geocaching.com" on the coin? Depending on price, I would be interested in at least 1 full set, and probably a couple of extra coins. PM sent. Thanks. I'm in for one gold! In any case, we fell in love with Italy in the Fall of 2005 (our first trip overseas), and have been thinking about our return trip since we came home. We would love to get one of each metal. Very nice design E-mail sent. If we might offer a proposal for the future: how about a series of coins featuring some of the cities of Italia? Venezia, Milano, Palermo, etc... A unified theme on one side, and a "typical" scene (gondola on a canal, or St, Mark's Square, for example, for Venice) for each city. Having cached in Milano and Venezia, I know that there is a link to caching in this. The coin has naturally a own icon and a prefix (IT).